Conrad Brunner figured opening a sports cards shop was a logical move. “What else is a retired sportswriter going to do to finish out?” Brunner said. 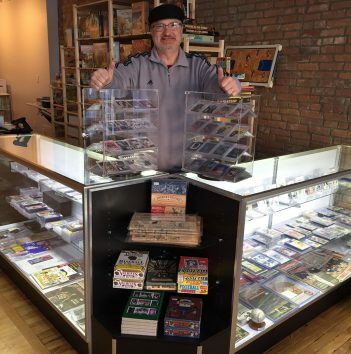 Bruno’s Shoebox, featuring mostly vintage sports cards and sports games, opened at 50 N. Ninth St., Noblesville, on Jan. 9, one day after his 60th birthday. Brunner left his job covering the Indianapolis Colts and Indiana Pacers with 1070 The Fan in August. Brunner came to Indianapolis to write for The Indianapolis News in 1988. The News merged staffs with The Indianapolis Star in 1995. Brunner remained with The Star until 2000 when he joined Pacers.com. In 2011, he joined 1070, writing stories and making radio appearances. Brunner’s personal memorabilia collection remains in a shoebox at home. He grew up a Washington Redskins and Washington Senators fan. He and his two older brothers had amassed a huge collection growing up. Jayson Manship, who once worked with the Pacers, owned several businesses in the building where Brunner’s store is located. He offered Brunner a spot a couple of months ago in his game store shop. “It was a lucky break for me because I have a home base instead of traveling around to go to shows all the time,” Brunner said. Andy Albert, who owns a sports card store in Indianapolis, is one of two people who motivated Brunner. The other motivator was Brody Stephens, an 8-year-old boy from New Palestine who died in April 2017 of viral complications from his battle with leukemia. So, Brunner and other sports card show dealers created Brody’s Card Shop for his funeral service. They brought their showcases and got his collection. The store is open from 10 a.m. to 6 p.m. Tuesday through Saturday.